In the year 2012, prestigious National Police Academy Hyderabad sanctioned a research project to search and compile the pro-victim judgments pronounced by the Privy Council, Supreme Court of India as well as High Courts. About 400 cases were analyzed and their briefs were prepared. It is helpful to the victim party as well as to Judicial officers, Senior Police officers, Public Prosecutors and Advocates. Public Prosecutor has the right to give up unnecessary and to drop won over witnesses. Public Prosecutor has the right to interview the witness to know his stand. Court cannot direct the Public Prosecutor to tender all the witnesses for examination. Public Prosecutor has the right to re-examine the witness in detail. Victim has a right to engage a private counsel. a) Private Counsel cannot replace the public prosecution. b) Private Counsel cannot address arguments before the Court. Public Prosecutor has the right to withdraw from the prosecution of the case. a) Notice to the complainant is not mandatory. b) Complainant has no locus-standi to interfere in the exercise of the discretion of Public Prosecutor to withdraw from prosecution. However, in such a situation the complainant can challenge the order of the government vide which the Public Prosecutor was directed to withdraw from prosecution. Public Prosecutor is a statutory office of high regard. He does not represent the investigation agencies but the state. A public prosecutor is not expected to show a thirst to reach the case in the conviction of accused somehow or the other irrespective of the true facts involved in the case. He has a wider set of duties than to merely ensure that the accused is punished, the duties of ensuring fair play in the proceedings, all relevant facts are brought before the Court in order for the determination of truth and justice for all parties including the victims. 1) To give up unnecessary and to drop won over witnesses. Public Prosecutor has the right to interview the witness to know his stand. It was a case of murder. On the day of occurrence deceased alighted from a bus near his house and was proceedings to his house. His son was following him. The accused who were four in number were present at the bus stop variously armed. On sighting the deceased one among the accused made an exhortation to finish him off and other accused fired his pistol which hit the deceased on this back. Victim fell on the ground. Son of the deceased rushed to rescew the deceased. Hearing the commotion the wife of deceased also reached at the spot. All the accused assaulted both of them also. Then the assailants dragged the deceased along the ground and brought him to their courtyard. They made a pyre with fire wood splinters and put the body of the deceased on it and set it a blazed while son and wife of the deceased were looking on aghast. In the FIR it was also mentioned that two other persons also saw the occurrence. During trial the Public Prosecutor examined son and wife of the deceased as witnesses and gave up other two witnesses as they were not to support the prosecution version. The Trial Court acquitted all the accused mainly on the ground that Public Prosecutor had not tendered all the witnesses before the Court for deposition. It was also held that by withholding independent eye-witnesses the prosecution has caused prejudice to the accused. The Trial Court was also of the view that interview of the witnesses by the Public Prosecutor to know their stand was also illegal. During appeal the High Court did not agree with these findings of the Trial Court and reversed the order of acquittal and convicted some of the accused for the offence of murder. Feeling aggrieved, the convicted accused filed appeal in the Hon’ble Supreme Court. One contention of the Defence Counsel was that Public Prosecutor was bound to produce all the witnesses before the Court for deposition. Another contention was that Public Prosecutor has no right to interview the witnesses before producing them in the Court. Whether public prosecutor can be insisted to tender all the witnesses before the Court? Whether public prosecutor has the right to drop un-necessary/won over witness? Whether public prosecutor has the right to interview the witnesses to know his stand? Court cannot direct the PP to tender all the witnesses. The Public Prosecutor is not bound to examine each and every witness cited by the police. He has the right to drop unnecessary and won over witnesses. Public Prosecutor has the right to re-examine the witness in detail. Court cannot direct the Public Prosecutor to confine his question to ambiguities. The Court can also not direct the Public Prosecutor to ask a limited number of questions. Public Prosecutor has the right to get the matter referred in the cross- examination clarified from the witness. It was a case of murder. At the time of commission of crime, the victim was travelling in a bus. The accused came to know about this and they boarded the bus on the way. After the vehicle moved for some distance, assailants mounted attack on the deceased with chopper and knives. After accomplishing the object all the accused alighted from the bus and escaped from the scene. The driver of the bus drove the vehicle to the police station. FIR was lodged on the basis of the statement of the conductor of the bus. The accused were arrested and after interrogation the weapons used for the murder were recovered by the Investigating Officer. After completion of investigation chargesheet was presented in the Court. During Trial the driver of the bus was examined as PW-12 and Investigating Officer as PW-13. There were major discrepancies between the statements of these witnesses. As per PW-13 the accused was arrested on the next date of occurrence and weapons were recovered thereafter. But as per statement of PW-12 the accused were arrested on the same day. Though there was an opportunity with the Public Prosecutor to elucide the ambiguity and to get the explanation from the witnesses about this material discrepancies the Public Prosecutor did not avail the opportunity, as he was of the view that during reexamination only ambiguities occurred in the cross examination can be clarified. During re-examination, he was authorized only to ask a limited number of questions. The Trial Court acquitted all the accused on the basis of this and some other discrepancies. During appeal a Division Bench of the Madhya Pradesh High Court convicted two out of the three accused and sentenced them to undergo life imprisonment. The convicted accused filed appeal in the Hon’ble Supreme Court. One contention of the accused was that while re-examining a witness, the Public Prosecutor is confined to ask questions only to clarify the ambiguity. Whether the right of PP while re-examining a witness is only confined to clarification of an ambiguity? Whether any matter referred in cross-examination can also be got explained in re-examination? 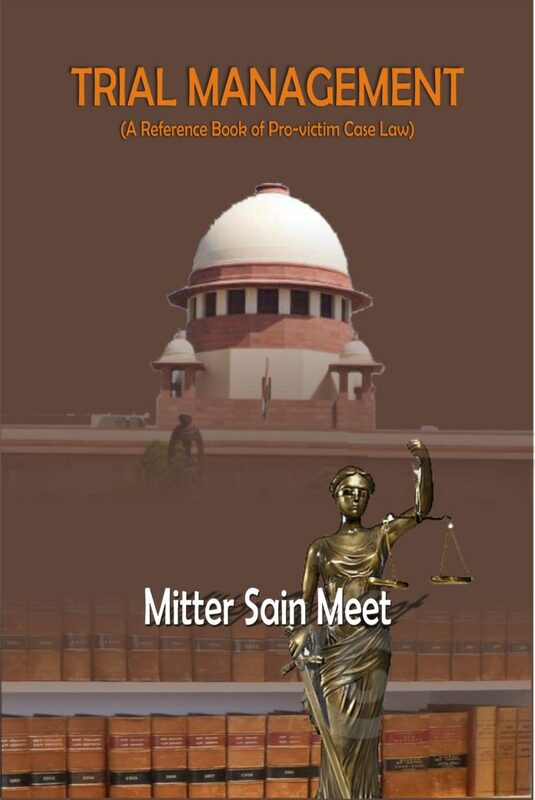 The Hon’ble Supreme Court held that the PP has the right to reexamine the witness in detail, and that re-examination cannot be confined to clarification to ambiguities and that the PP has the right to get any matter referred in cross-examination explained from the witness during re-examination. Para “17. There is an erroneous impression that re-examination should be confined to clarification of ambiguities which have been brought down in cross-examination. No doubt, ambiguities can be resolved through re-examination. But that is not the only function of the re-examiner. If the party who called the witness feels that explanation is required for any matter referred to in cross-examination he has the liberty to put any question in re-examination to get the explanation. The Public Prosecutor should formulate his questions for that purpose. Explanation may be required either when ambiguity remains regarding any answer elicited during crossexamination or even otherwise. If the Public Prosecutor feels that certain answers require more elucidation from the witness he has the freedom and the right to put such questions as he deems necessary for that purpose, subject of course to the control of the court in accordance with the other provisions. But the court cannot direct him to confine his questions to ambiguities alone which arose in crossexamination. “18. Even if the Public Prosecutor feels that new matters should be elicited from the witness he can do so, in which case the only requirement is that he must secure permission of the court. If the Court thinks that such new matters are necessary for proving any material fact, courts must be liberal in granting permission to put necessary questions. Guidelines given by the Hon’ble Supreme Court to the Public Prosecutor. “19. A Public Prosecutor who is attentive during cross- examination cannot but be sensitive to discern which answer in cross-examination requires explanation. An efficient Public Prosecutor would gather up such answers falling from the mouth of a witness during cross-examination and formulate necessary questions to be put in reexamination. U/s 301(2) of Cr.P.C, the complainant has right to engage a private Counsel. However, the rights of the Private Counsel are limited. Brief facts of the case are that a case U/s 325, 331 & 120-B IPC was pending in the Court of Sessions Judge. The complainant requested the Trial Court that a number of connected civil cases are also pending in various Courts. His Advocate is conducting those cases and is well conversant with the facts of the present case also. He sought permission from the Court to engage a Counsel to prosecute the case. Request of the complainant was declined by the Trial Court. Feeling aggrieved, the complainant filed a revision petition in Hon’ble High Court. One contention of the Counsel of the complainant was that the complainant was fully competent to engage a private Counsel to prosecute the case. Whether a Private Counsel engaged by the complainant can replace by the Public Prosecutor? The Hon’ble High Court held that private Counsel cannot replace the Public Prosecutor. The complainant of this case sought permission from the Trial Court that his counsel be allowed to address arguments before the Court. This request was accepted and the Private Counsel was allowed to address the arguments. The accused challenged this order in the Hon’ble High Court. One contention of the Defence Counsel was that a private Counsel has no right to address arguments before the Court. Whether a Private Counsel engaged by the complainant can address arguments before the Court? While setting aside the order of the Trial Court, Hon’ble Delhi High Court held that Private Counsel cannot address arguments before the Court. He may with the permission of the Court, submit the written arguments after the evidence is closed in the case. The accused in this case were facing charges U/s 302 IPC. A DSP and a doctor appeared as defence witnesses. The Public Prosecutor did not cross-examine these witnesses. Feeling aggrieved the complainant moved an application with the request to cross examine these witnesses through his Private Counsel. This application was rejected by the Trial Court. The complainant filed a revision petition in the Hon’ble High Court. One contention of the Counsel of the complainant was that the Public Prosecutor has not performed his duty properly. His Counsel may be allowed to cross examine the defence witnesses. Whether a Counsel engaged by a complainant can cross examine the defence witnesses? The Hon’ble High Court held that Private Counsel has no right tocross examine the defence witnesses. Direction to the Public Prosecutor to cross examines the defence witnesses with the help of the Counsel of the complainant. The Public Prosecutor who is conducting the trial has vast powers to withdraw the case from prosecution. But these powers are not arbitrary. The Public Prosecutor has to follow some principles before taking the decision of withdrawl from prosecution. The complainant of the case has no right to interfere with the decision of the Public Prosecutor. If he feels aggrieved, he can challenge the order of the government vide which the Public Prosecutor was directed to withdraw from prosecution. Principles governing the withdrawal from prosecution by the Public Prosecutor. Government has power to order the Public prosecutor to withdraw from prosecution. B. Public prosecutor has to apply his mind independently before filing application for withdrawl from prosecution. Notice to the complainant is not mandatory. D. Right of the complainant:- However, In such a situation the complainant can challenge the order of the government. On the basis of the complaint of a de facto complainant the present case was registered under Sections 147, 148, 447, 438, 307, 323 read with Section 506 IPC against 31 persons. After completion of investigation charge-sheet was presented in the Court of Judicial Magistrate. Before the matter was committed to the Court of Sessions, the Assistant Public Prosecutor filed a petition U/s 321 of Cr.P.C. seeking permission of the Court to withdraw from prosecution. In the petition, the Assistant Public Prosecutor along with some other grounds of withdrawl from prosecution also mentioned the order of the government vide which he was directed to withdraw from the prosecution. The Judicial Magistrate granted permission and discharged the accused. Feeling aggrieved, the complainant challenged the order of the government. One contention of the Counsel of the complainant was that government has no jurisdiction to order the Public Prosecutor to withdraw from prosecution. The Public Prosecutor was to apply his own mind before filing the application for withdrawal from prosecution. Another contention was that complainant had the right of hearing before the passing of the order of discharge. Whether government has jurisdiction to issue orders to the P.P. to withdraw from Prosecution? Whether application of mind of P.P. while filing the withdrawal application is mandatory? Whether before issuing the impugned order, notice to the Complainant is mandatory? Whether complainant of the case has a right to challenge the order of the Court vide which the government directed the PP to withdraw from prosecution? Public prosecutor has to apply his mind independently before filing application for withdrawl from prosecution. Right of the complainant:- However, In such a situation the complainant can challenge the order of the government. Neither complainant nor charge witness has locus-standi in the exercise of discretion of P.P. to withdraw from the Prosecution. On 7-8-1992 at about 10.30 a.m., the accused formed themselves into an unlawful assembly armed with deadly weapons and in furtherance of the common object of their unlawful assembly, obstructed public servants from their duty and caused injury to them and mischief to public property. The incident happened due to the long standing family as well as political enmity between the parties. The complainant and charge witnesses were Trade Union Leaders and the accused were local leaders of rival political groups. (iv) that it will also be in the interest of justice. The Asst. Sessions Judge issued notice to CWs. 1 to 7, who suffered injuries in the case. After their appearance before the Court, they were examined by the Court. CW- 1 as PW-1 stated that damage to the public property was caused in this case. He further stated and took objection on allowing the petition. The Trial Court dismissed the petition of the PP on the ground that as damage to public property has been caused by the accused and that the injured has also objection to the withdrawl. The accused filed revision petition in the High Court. One contention of the accused was that neither the complainant nor the charge witness has locus standi in the exercise of the discretion of the Public Prosecutor. Whether complainant has locus-standi in the exercise of discretion of PP to withdraw from prosecution? The Hon’ble High Court held that the complainant has no locus-standi to interfere in the exercise of discretion of PP to withdraw from prosecution. Para “16. It is also pertinent to note that the Asst. Sessions Judge has committed illegality in issuing notice to CWs. 1 to 7 in the case. Under the provisions of Section 321 of the Cr. P. C. when the Public Prosecutor applies for withdrawal from prosecution, the complainant or the charge witnesses has not locus standi in the exercise of the discretion by the Public Prosecutor to withdraw from prosecution. “12. There can be no doubt that only the Public Prosecutor or the Assistant Public Prosecutor in charge of the case and none else, with the consent of the Court, could apply for withdrawal from prosecution. He is not expected to act according to the instructions of the complainant but is the sole Judge. The complainant does not come into the picture and indeed has no locus standi in the matter of exercise of discretion by the Assistant Public Prosecutor.